Beef Goulash, this is food from my childhood. Now I'm married with 3 kids and this is now their food from their childhoods. I love it. Food that I grew up on, my husband grew up on, and now my kids will grow up on. I am a true fan of simple cooking, I love when I only have to spend a few minutes preparing things, a bit of starter cooking and then you just allow something to simmer away for about 2 hours, and dinner is done. Some may not like that idea, but I find it very relaxing and I just love the aroma that spreads through the house as a stew cooks. 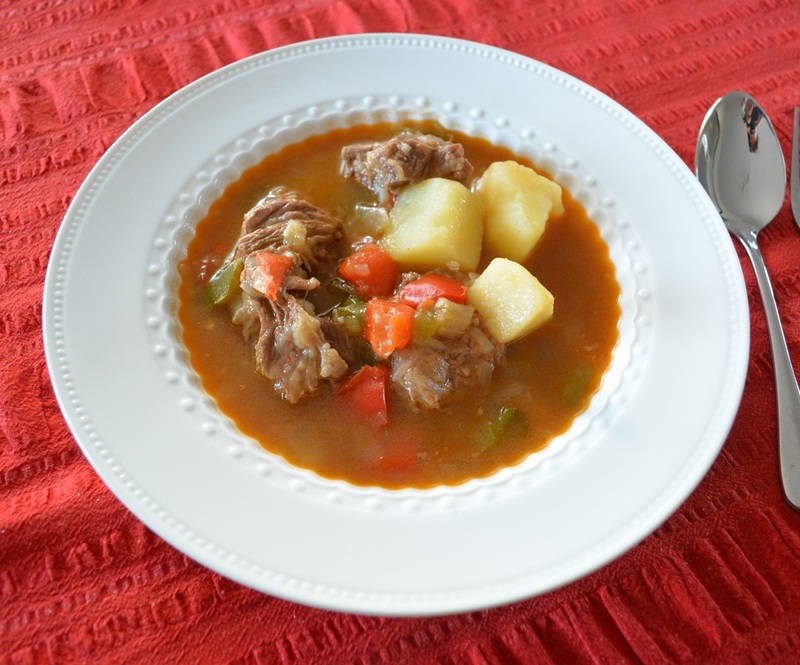 We really do love stews in our house, we love to eat with a spoon, soups and stews are regularly made in our house, all year round, as they are just delicious, they just taste so good. I like to cut the meat up into a larger dice, rather than a smaller one. I find it just tastes better if larger, it can dry out if too small, I think, at least. But don't go measuring, I just chop it up as I feel like it. Now the original recipe says to serve this up with some soft polenta, this I think would be lovely, but in all honesty I just serve it with some crusty bread and we mash up the potato pieces in our plates to thicken the sauce. 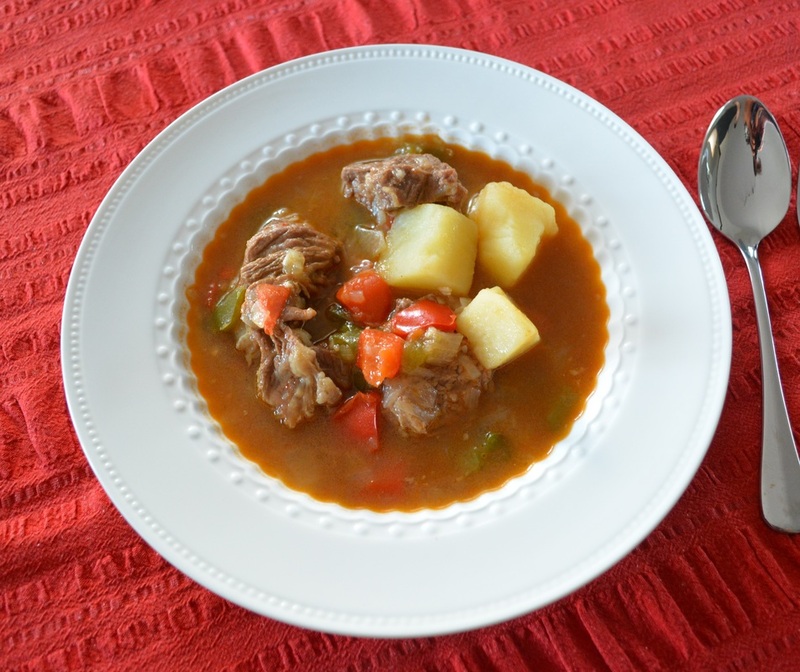 So if you love a good stew, a simple good stew, give this one a try, it is lovely. Add 2-3 tablespoons of oil to a large saucepan. Heat over a low-medium heat. Add onions and sauté for 4 minutes or until the onions have softened. Add garlic and pancetta, sauté, for a further 1 minute. Add the meat, cook, stirring, until browned lightly. Season with salt and pepper. Add the tomato paste, stir through, cook, stirring for 1-2 minutes. Add vegeta and just enough water to completely cover the meat. Bring to the boil, reduce heat to low and simmer for 40 minutes. Whilst the meat is cooking, peel the potatoes and cut them into a bite sized dice. Add the potatoes and the red and green capsicums into the meat mixture. Top up with more water, if needed, so all the ingredients are covered with water. Bring to the boil, reduce heat to low and simmer a further 45-50 minutes, or until the meat is soft and the vegetables are cooked. Serve with crusty bread or with soft polenta.